If you're tired of insufferable SEC fans trying to convince you that their perennial bottom-dwellers could run through any other conference, you can say whatever you want about the SEC East this year. The West division, however, is an insane collection of talent. The first of today's three top-15 matchups within the division was between Mississippi State and Texas A&M, and the Bulldogs annihilated the Aggies 48-31. The win was the Bulldogs' second straight over a top-10 opponent, after they knocked down LSU in September. It wasn't close the whole way, with the Aggies adding a couple late touchdowns to make the score look much better. 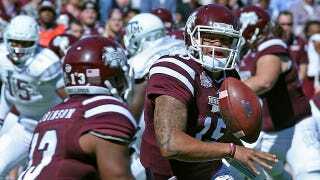 Dak Prescott threw two touchdown passes, and ran for three more for Mississippi State. Running back Josh Robinson added two ground scores of his own. Kenny Hill's four touchdown passes were overshadowed by his three interceptions, and he attempted a ridiculous 62 passes. Now, our attention turns to No. 3 Alabama and No. 11 Ole Miss, both undefeated this season and 1-0 in the conference. The winner will move into a tie for first in the division with the Bulldogs. No. 5 Auburn has a chance to to remain undefeated as well, but they'll have their hands full with No. 15 LSU.